Rolls-Royce has signed a contract with C-Energy in the Czech Republic to extend its power plant installed capacity by a further 23 MWe. The delivery includes two gas-fired gensets based on the new 20 cylinder Rolls-Royce medium speed V-engine, B36:45, that was launched in September. Rolls-Royce will also be supplying long term services for the new engines. The new B36:45 engine series is said to set a new standard in power and efficiency with exceptionally low fuel consumption and emissions of NOx, CO2, SOx and particulates. 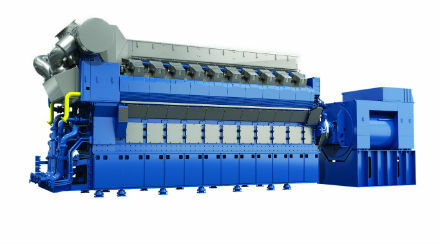 At 600 kW per cylinder it offers a 20 % increase in power per cylinder compared to its predecessor, the B35:40 unit. The V20 is the largest variant available with an electrical output of 11.8 MWe. “Our new range of medium speed gas engines builds on the success of the B35:40-series and offers ... a completely new modular architecture, numerous configurations, fuel flexibility, and low life cycle costs, we believe it is truly engineered for the future,” said Jeff Elliott, managing director of Bergen Engines AS, which is part of Rolls-Royce Power Systems. The existing 60 MWe power plant of C-Energy was reconstructed at the beginning of 2015 with four B35:40V20 gas engines. At that time it was the first natural gas power plant based on medium- speed gas engines in the South Bohemian region prepared to supply heat and power to the local grid. “Delivery of four Rolls-Royce engines among other investments helped to transform the old coal fired central heating plant into a modern power plant in 2015” commented Ivo Nejdl, Director and co-owner of C-Energy. Owing to low coal prices however, electricity and heat in the region is still mainly generated by coal-fired plants. So the extension of the gas fired plant is considered as a step forward towards a green future for the region and the country. With the extension, the power plant will, from the end of 2019, deliver a total of 83 MWe electricity and heat for companies and homes in the nearby town of Tabor/Sezimovo Ústí roughly 100 km southeast of Prague. The engines quick-start capability means the engines can ramp up to their rated load within five minutes. In addition the new engines will be certified to provide primary and secondary grid regulation.